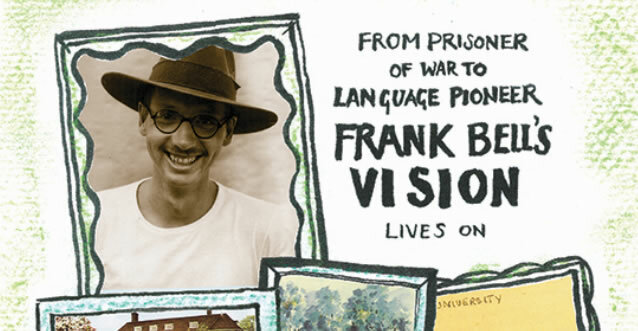 In a prisoner of war camp over half a century ago, a love of languages and a passion for education established one man's lifelong commitment to international understanding. Frank Bell, the founder of The Bell Educational Trust Limited, was taken prisoner in the Second World War in Java in 1942. During his imprisonment he was held in five different Japanese prison camps. Prisoners in these camps were forbidden to teach, learn, compile or possess notes on any subject or meet in groups for discussion. Serious study was impossible due to frequent moves between prisons and the confiscation of materials. However, confronted with desperate conditions in the camp, Frank Bell established an 'Undercover University'. He organised language classes in Spanish, French, Dutch, German, Italian and Russian, as well as history and public speaking. Lessons, timetables, vocabulary, grammar exercises and multilingual dictionaries were written on every scrap of paper that could be found, from the backs of envelopes and soap wrappers to government forms and tobacco wrapping paper. After the war, Frank Bell returned to England, and worked for the University of Cambridge. He was convinced that international understanding and harmony could exist if people throughout the world understood each other through language. He founded the first Bell Language School in Cambridge, England in 1955 and later with his wife Elisabeth, established The Bell Educational Trust Limited in 1972, with the aim of providing language education, mainly in English, for adult students and young learners; to train teachers and to offer language learning and teacher training experiences that promote international understanding and intercultural exchange. The Frank Bell archive is held at the Imperial War Museum, London, and can be visited by appointment. The archive contains documents from the secret university at Kuching and includes photographs, dictionaries, certificates and records. For more than 60 years, The Bell Educational Trust Limited has carried out English language teaching activities around the world as an educational charity, becoming one of the leading providers of language education in Britain. The Bell Foundation furthers Frank Bell’s vision by working to change lives and overcome exclusion through language education.